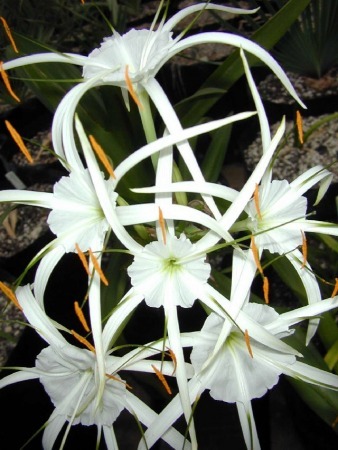 The three closely related genera once classified as Hymenocallis are Ismene, Elisena, and Leptochiton. Ismene, Elisena and Pseudostenomesson are now considered subgenera of Ismene. 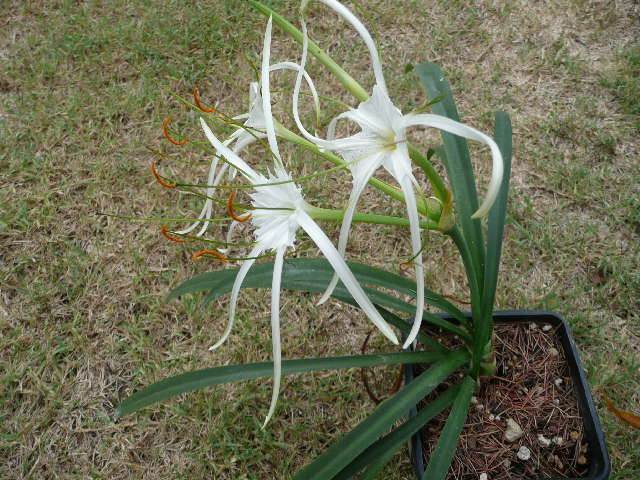 For the description of the difference between Ismene and Hymenocallis consult the Ismene wiki page. 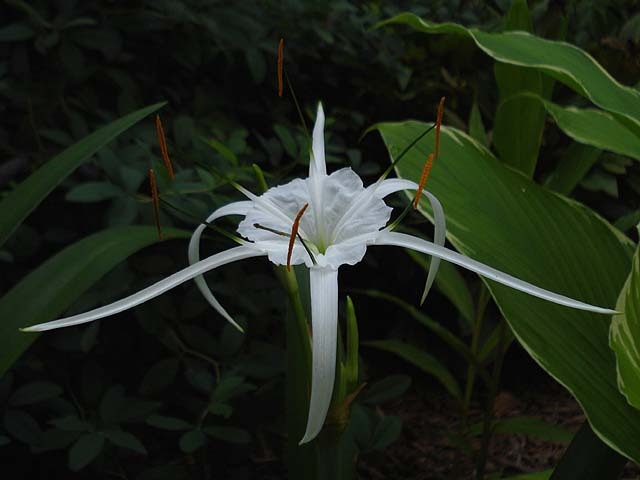 Leptochiton (the former Hymenocallis quitoensis and Hymenocallis heliantha) is recognized as a distinct genus. 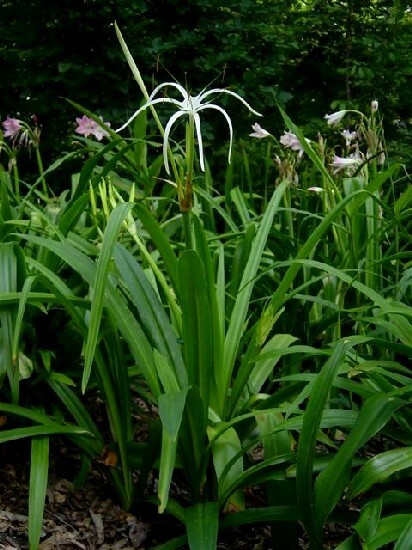 Ismene Hybrids includes hybrid plants that are part of the Hymenocallis complex including the genera Elisena, Ismene, Hymenocallis, and Leptochiton. 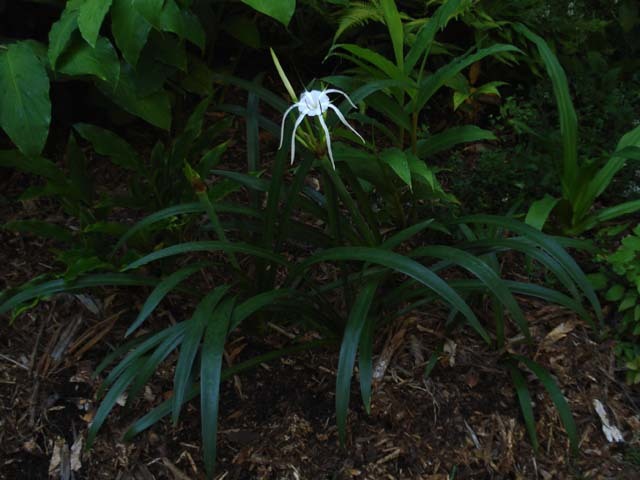 The plants known as Hymenocallis × festalis and Hymenocallis × spofforthiae 'Sulphur Queen' will be found on this page. 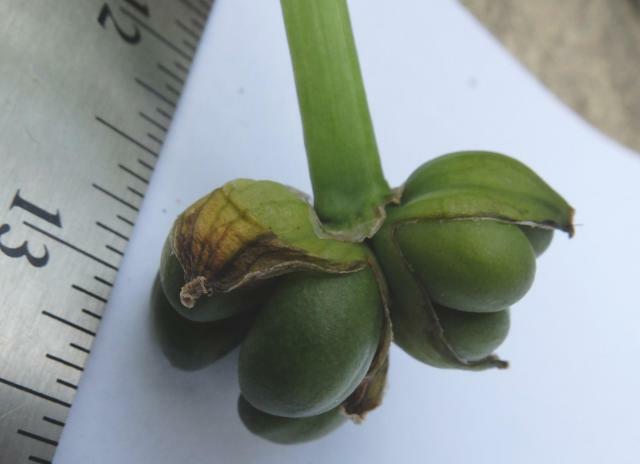 Seeds are fleshy and tend to be of odd shape and can vary quite a bit in size on a single pod. When the seeds mature, just toss them on the surface of the pot beneath the parent plants. Keep the potting mix moist. Germination can take up to 3-4 months (Dave Lehmiller, Stephen Hopkins). Some growers prefer to plant the seeds half-way into the mix. Early spring bloomers such as H. liriosme, H. coronaria, H. crassifolia, etc... sprout within a month or so while the late season bloomers may not sprout until the following spring (Stephen Hopkins). 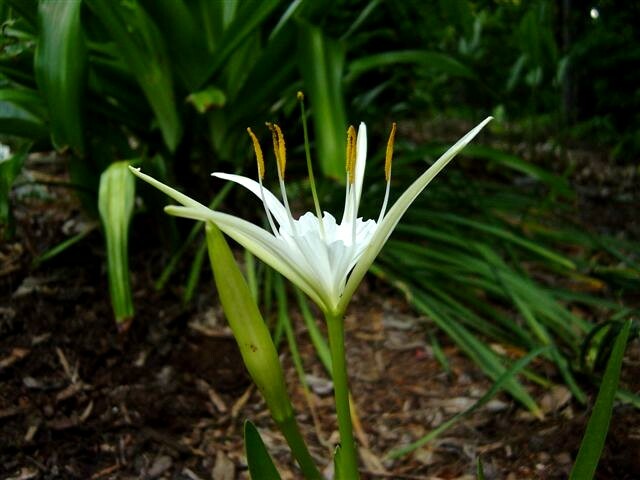 Hymenocallis acutifolia (Herb. ex Sims) Sweet is native to Mexico. 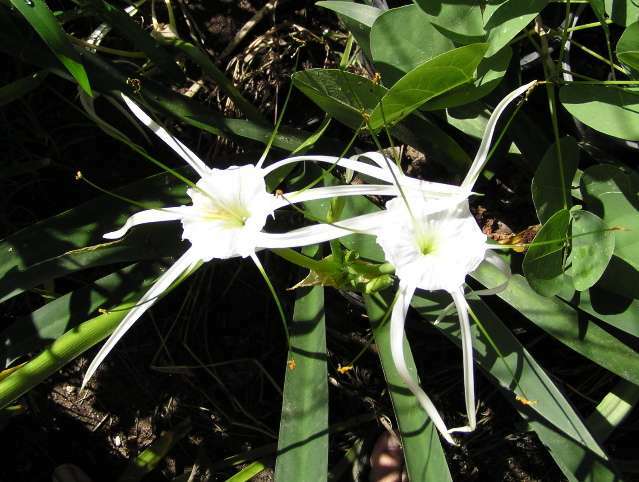 It has narrow foliage and blooms from late summer through autumn. Photos taken August 2007 by Jay Yourch. 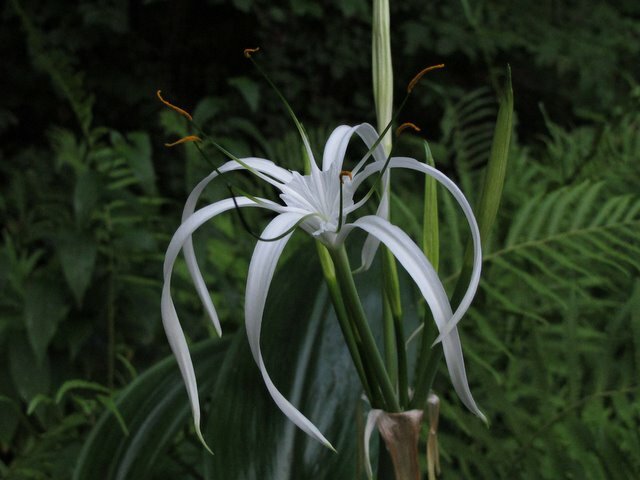 Hymenocallis azteciana Traub is native to western Mexico. Photos from Alessandro Marinello. 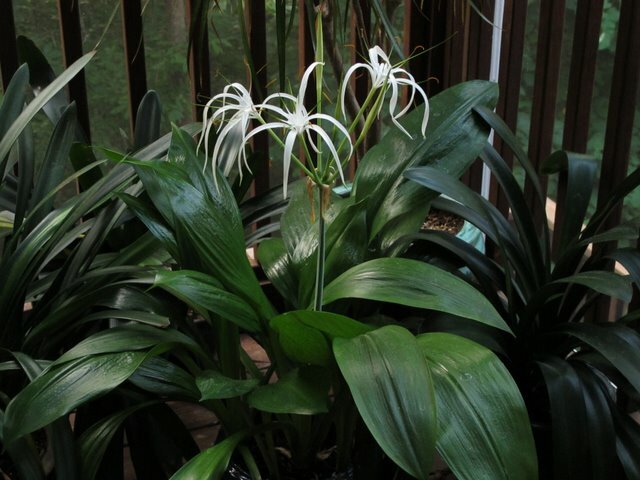 Hymenocallis caribaea 'Variegata' has attractive grayish green foliage with wide creamy white margins. Photos taken August 2007 by Jay Yourch. 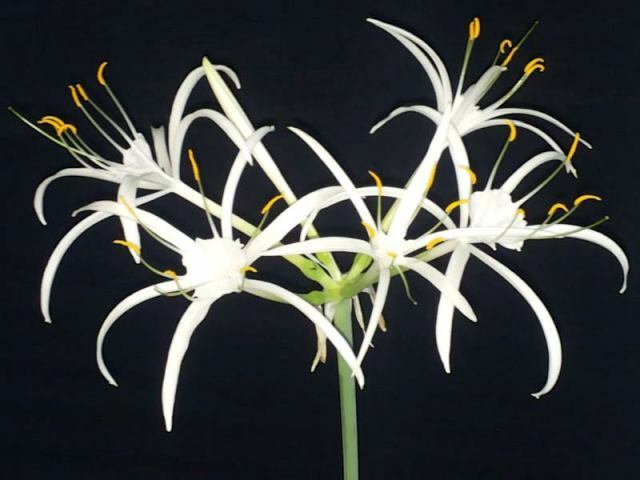 Hymenocallis durangoensis T.M.Howard is a species from Mexico. Photos from Alessandro Marinello. 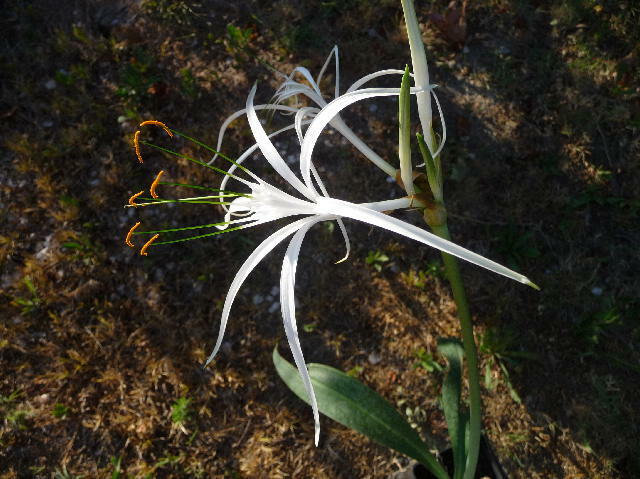 Hymenocallis eucharidifolia Baker is native to Mexico. 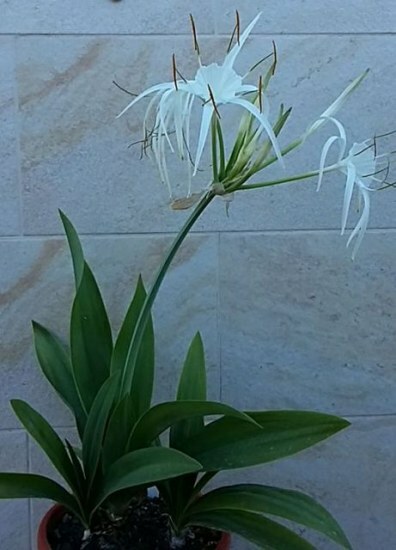 A beautiful flower on a beautiful plant, it flowered at the same time as Hymenocallis sonorensis. Photos taken September 2004 by Lee Poulsen. 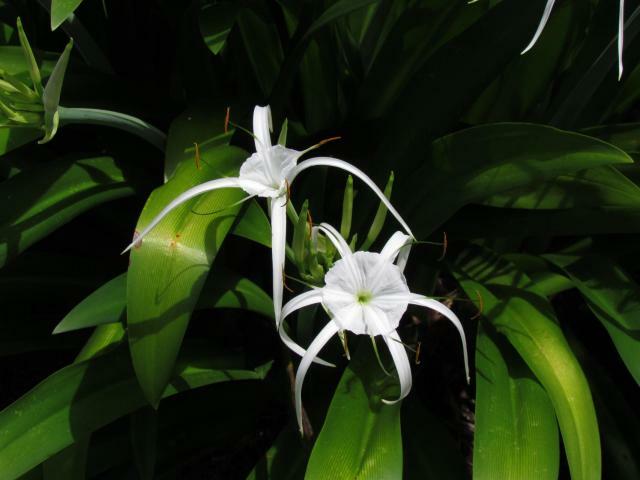 Hymenocallis fragrans (Salisb.) Salisb. 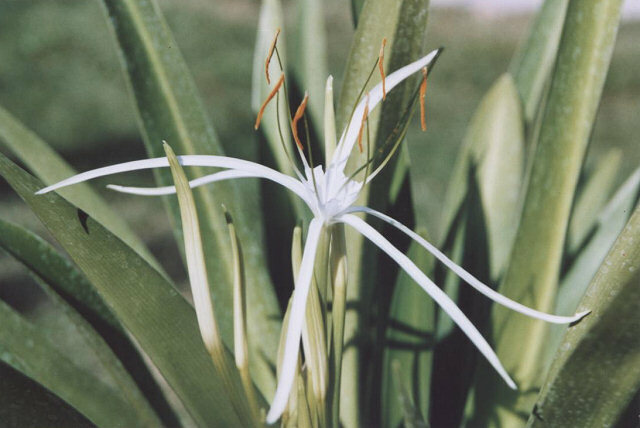 is a tropical evergreen species from West Indies, with broad petioled leaves, similar to Hymenocallis speciosa but smaller. 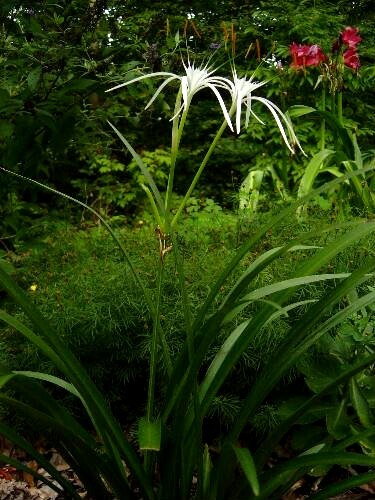 It flowers in late summer, together with the appearance of the new leaves. It can be briefly dormant in mid summer. Photos by Angelo Porcelli. 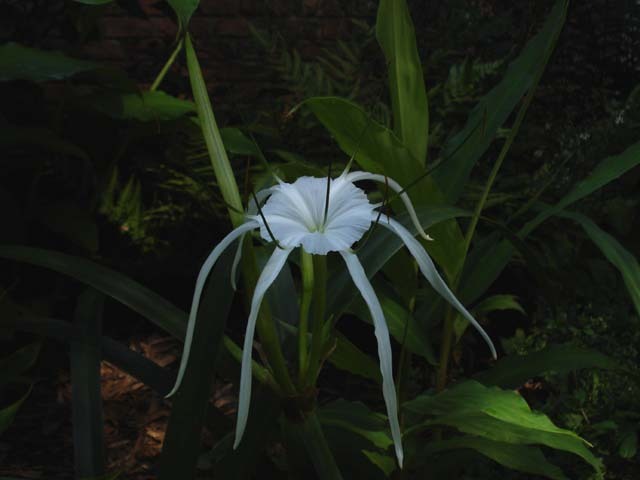 Hymenocallis harrisiana Herb. is a deciduous species from Mexico. 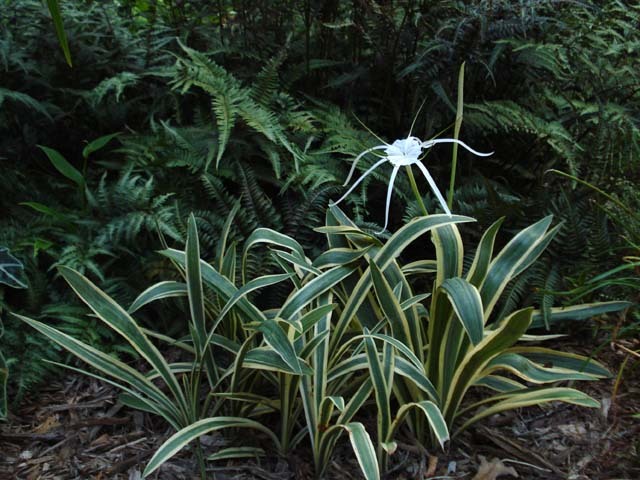 The strap shaped leaves are glaucous, as it comes from an arid area. 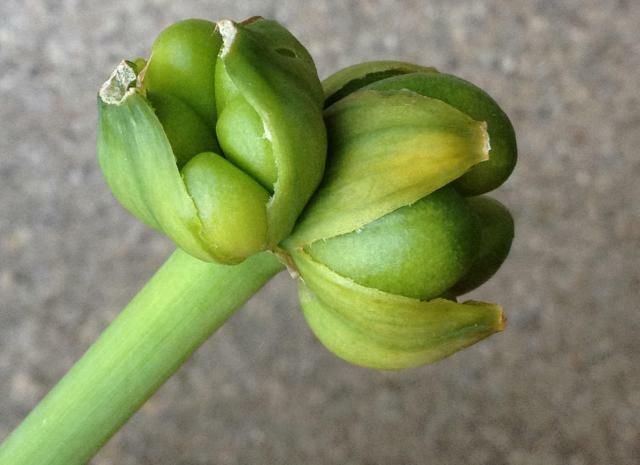 The flower has a small scented corona (crown). Each flower lasts only one night. Photos taken by Alberto Grossi and Jay Yourch. 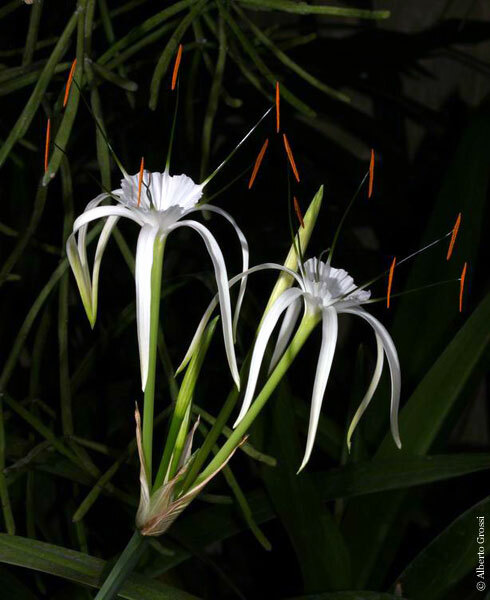 Hymenocallis liriosme (Raf.) Shinners growing in the Lady Bird Johnson Wildflower Center. 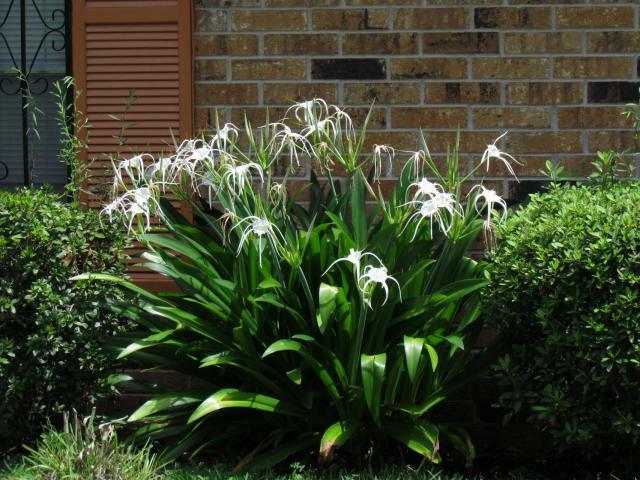 It is native to the southern US in Texas, Oklahoma, Arkansas, Louisiana, Mississippi, and Alabama. Photos 1-2 of plants in bloom taken April 2004 by Lee Poulsen. 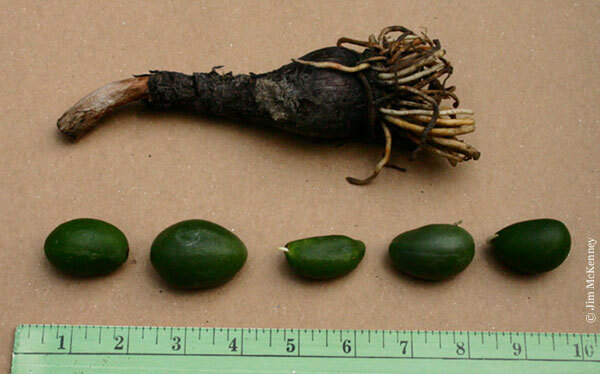 Photo 2 of a bulb and seeds supplied by Joe Shaw of Conroe, Texas, was taken by Jim McKenney. Two of the seeds are already germinating. 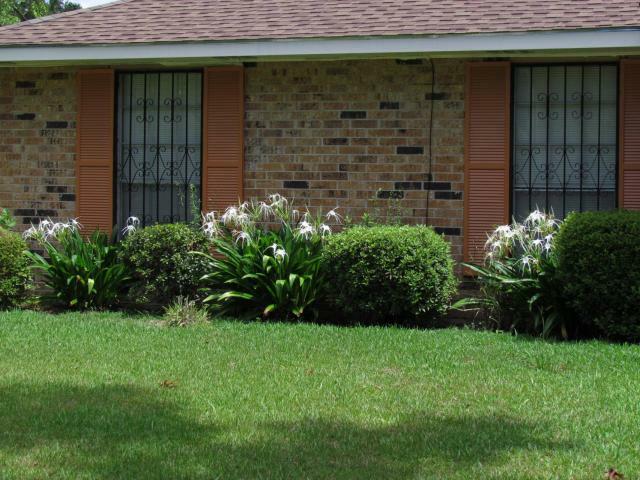 The photos below were taken by Nhu Nguyen of landscaping plants in an otherwise horticulturally bleak area of Baton Rouge, Louisiana. 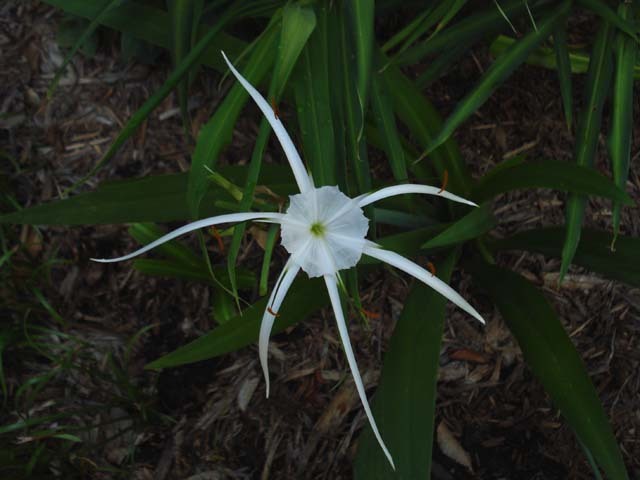 Hymenocallis littoralis (Jacq.) Salisb. 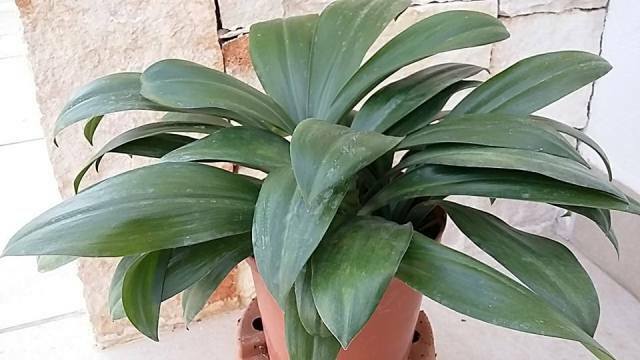 is a vigorous evergreen species from Mexico and Guatemala which grows with its roots in the water during the warm growing season, making a good garden subject in warm climates. It requires protection during cold winters. 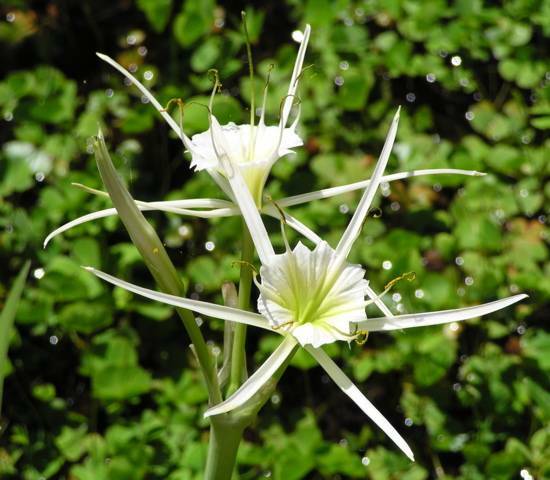 The lovely white flowers have long narrow reflexed petals behind a central cup. 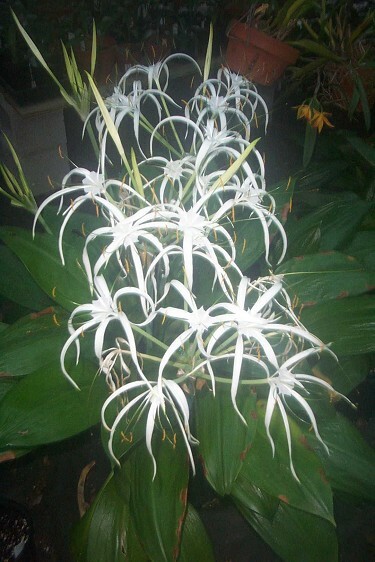 Several flowers are carried on each sturdy 70-90 cm stem. Photos by Bill Dijk and Alberto Grossi. 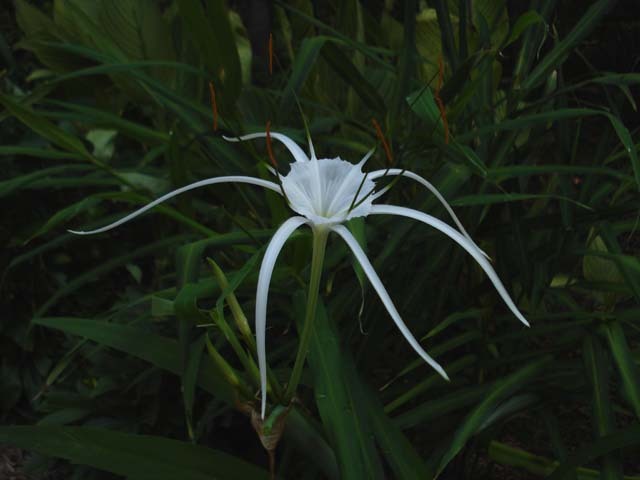 Hymenocallis maximillianii T.M.Howard (syn. 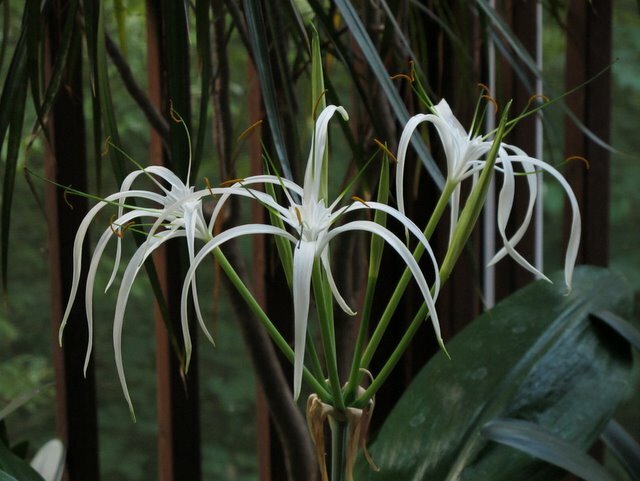 Hymenocallis maximiliani T.M.Howard) is native to Mexico. 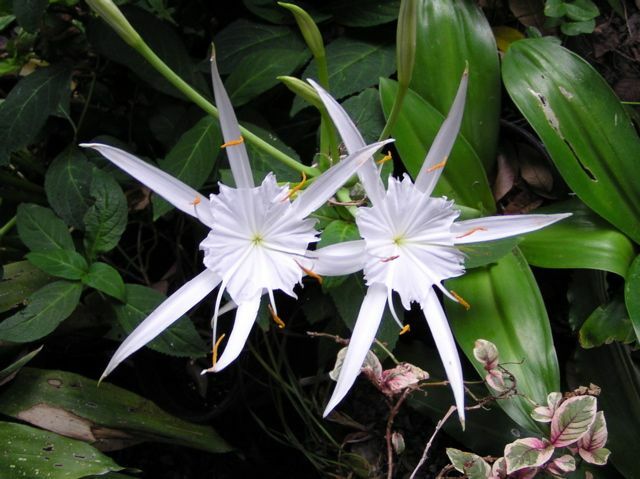 It has compact, narrow, erect, foliage and gracefully proportioned flowers. Photos taken August 2005 by Jay Yourch. Seed photos by Rimmer de Vries; the first one shows a ruler marked in inches; plants flowered in early June in Michigan; seed pictured at the end of June. 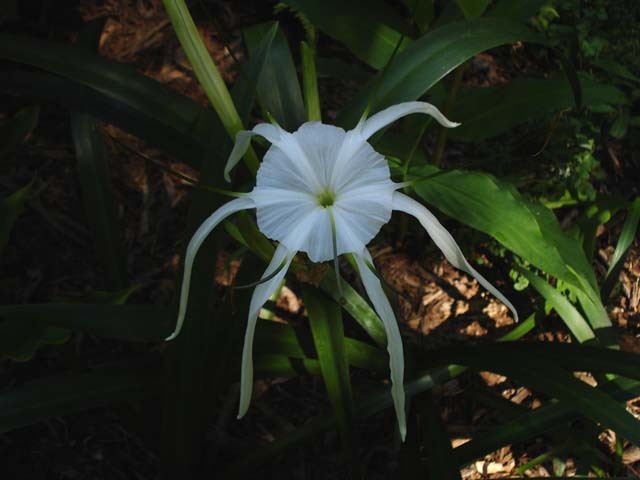 Hymenocallis occidentalis (Leconte) Kunth is native to the Eastern United States and blooms in late summer. 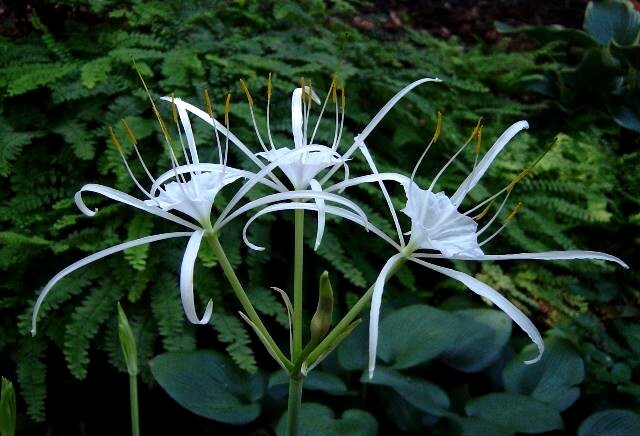 Depending on the plant and the growing environment the leaves may be absent, like a lycoris, or present at bloom time. Photos taken August 2006 by Jay Yourch. 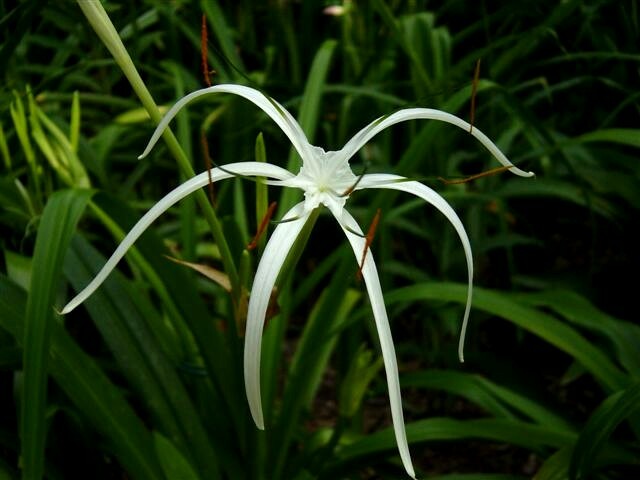 Hymenocallis riparia Greenm. is native to Mexico. 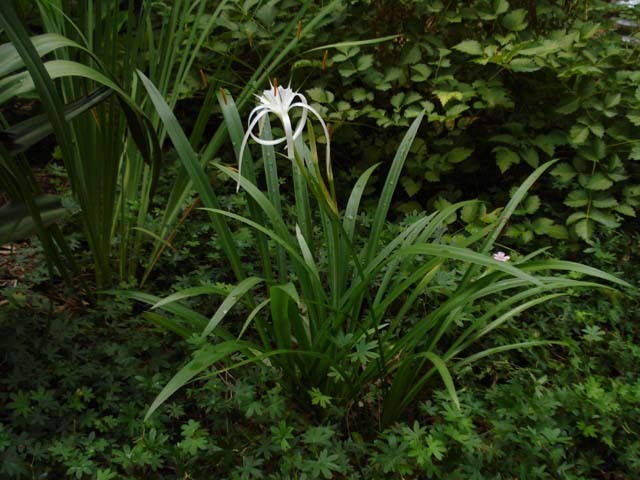 It's a small plant with narrow, spreading foliage. 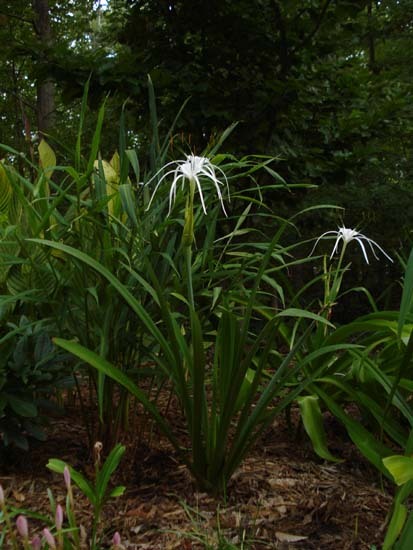 The Plant List notes this species is a synonym of Hymenocallis acutifolia. Photos taken July 2007 by Jay Yourch. 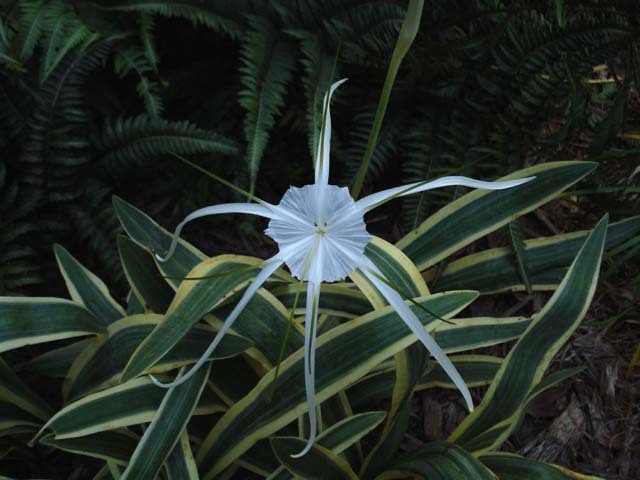 Hymenocallis 'Sister of Tropical Giant' has flowers like 'Tropical Giant', but all six segments recurve equally. 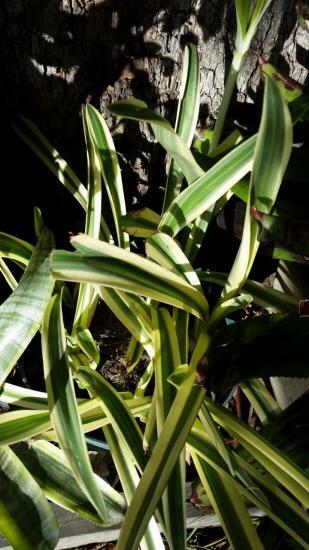 The foliage is broad and grayish green instead of the dark green, glossy foliage of 'Tropical Giant'. Photos taken by Jay Yourch. 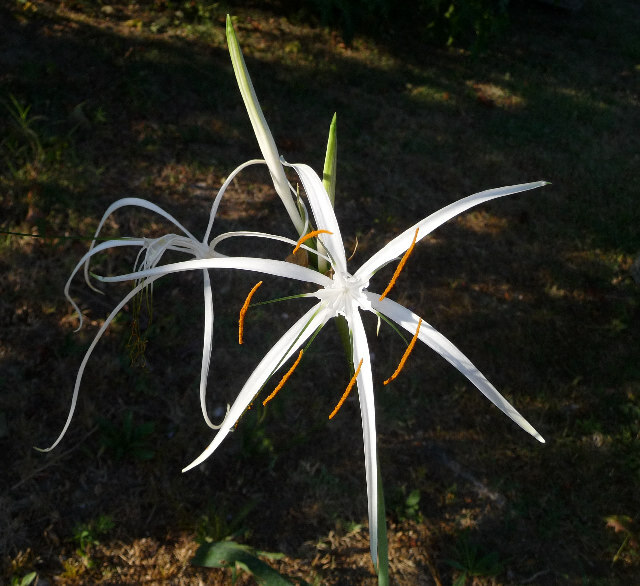 Hymenocallis sonorensis Standl. 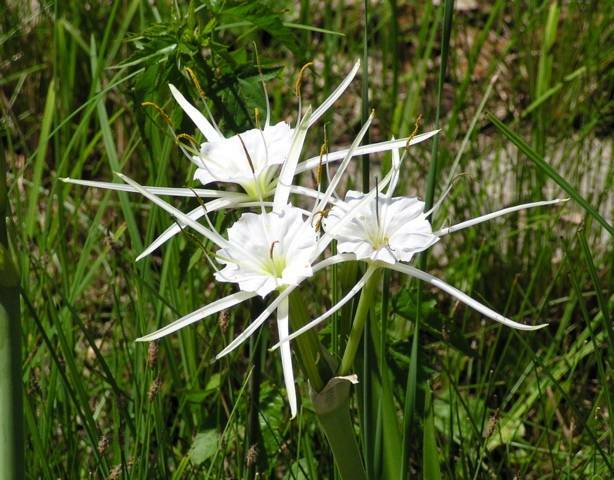 is found along streams and valleys throughout Sonora, Mexico. 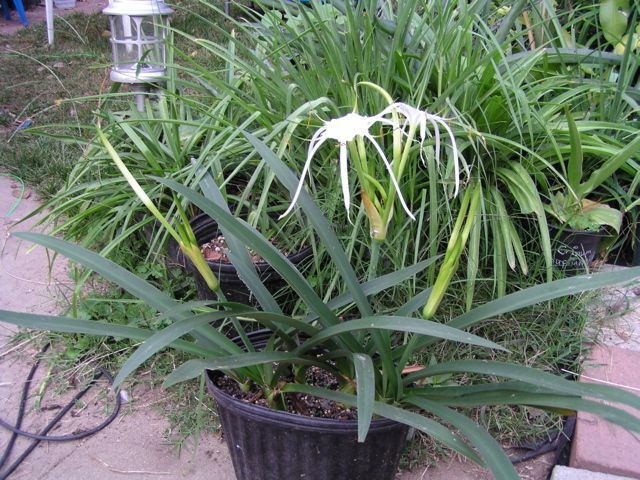 The first photo taken September 2003, but the plant grew even larger and had several scapes in September 2004. Photos by Lee Poulsen. 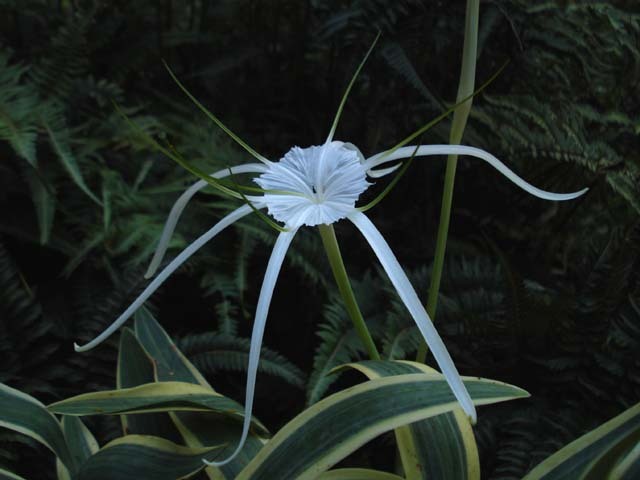 Hymenocallis spp. Below are three unidentified species. Help identifying them would be appreciated. 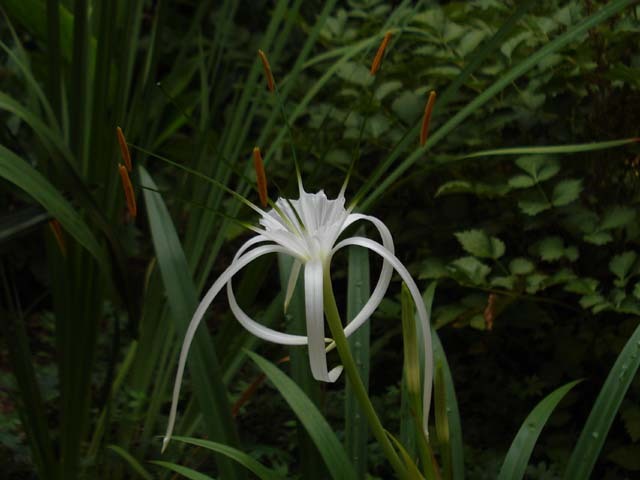 Hymenocallis sp. 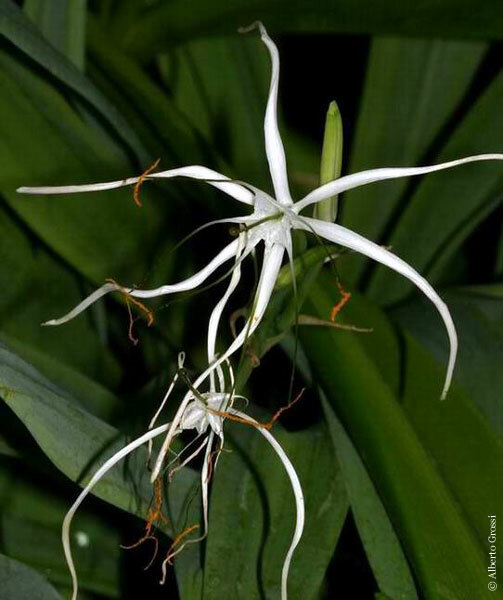 , photo by Kevin Preuss of a plant collected in Guatemala by Dr. Robert Dressler. 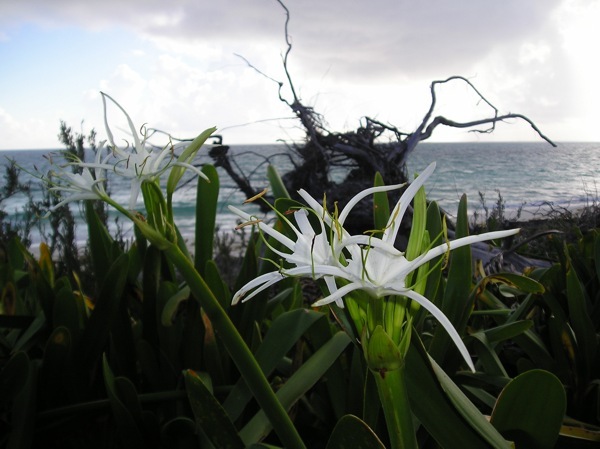 Hymenocallis sp., possibly Hymenocallis littoralis from Out Islands of Bahamas: 26 36' 13.76" N, 77 00' 37.17" W elev. 15'. Grown on active dune with up to 6" increase in dune height annually. Note extensions at bottom of bulb. 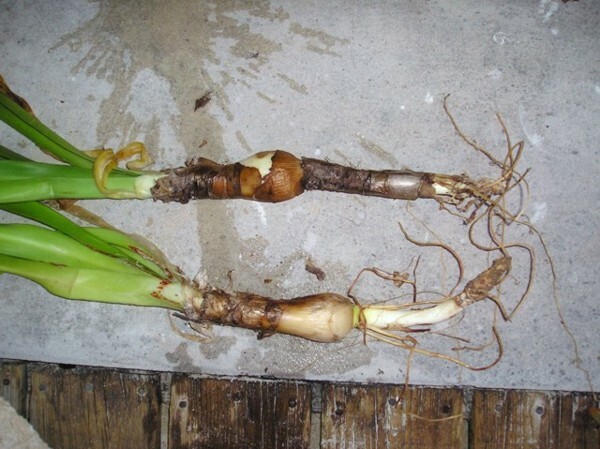 Out of almost 100 plants rescued from the ocean after hurricane Jeanne, most had these extensions or evidence that they had snapped off. It looks like the extension acts to keep the bulb near the surface as sand builds up on the dune. Interesting that the oldest section resembles a rhizome. Photos by Phil Andrews. 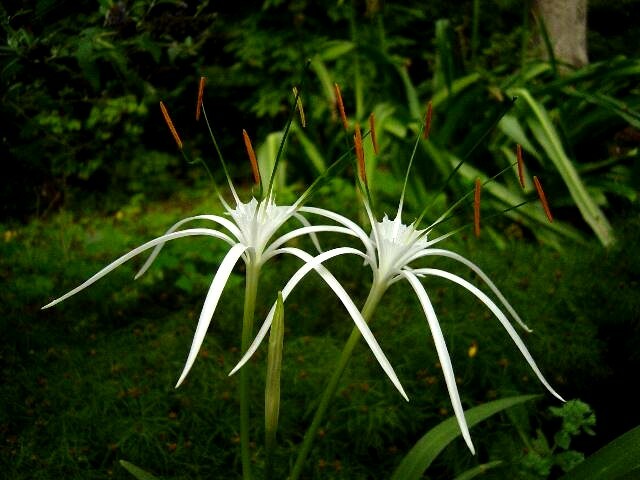 Hymenocallis sp. 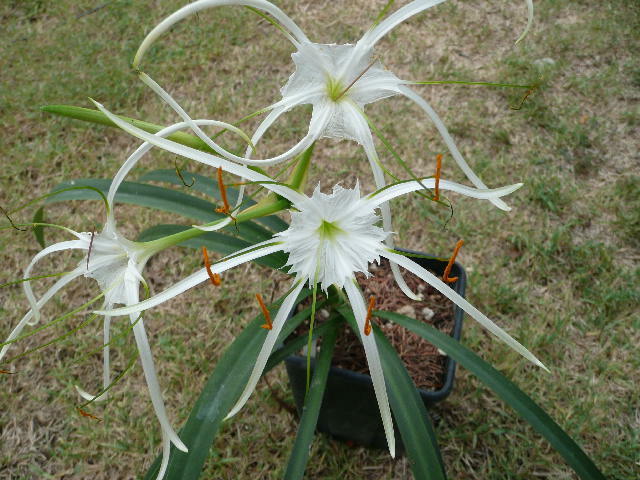 received as Hymenocallis philipinas by Alessandro Marinello. 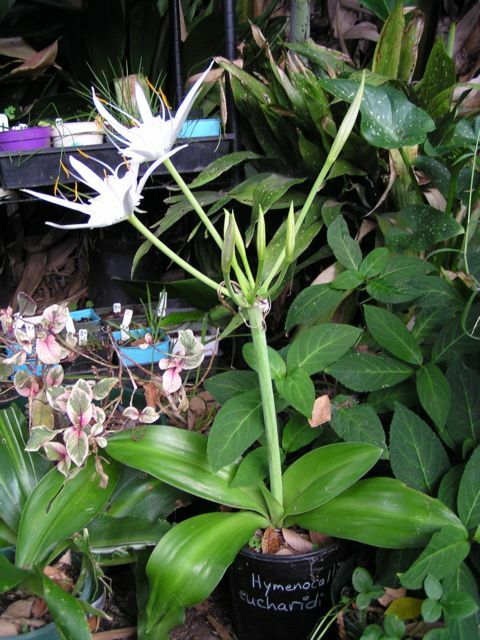 The bulb measured 9 cm in diameter with leaves 7 cm wide. It bloomed in October. 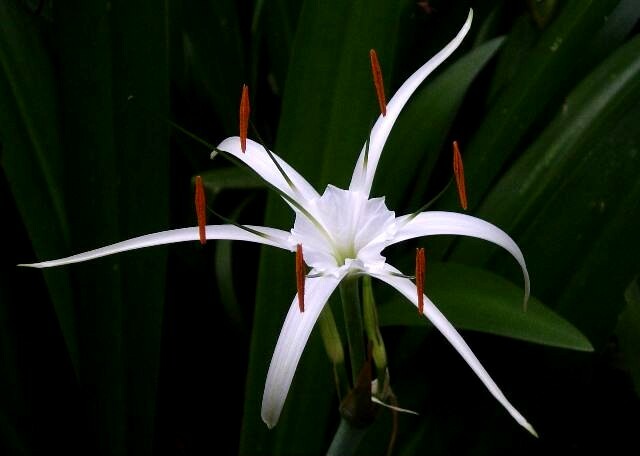 It was suggested to be Hymenocallis littoralis. 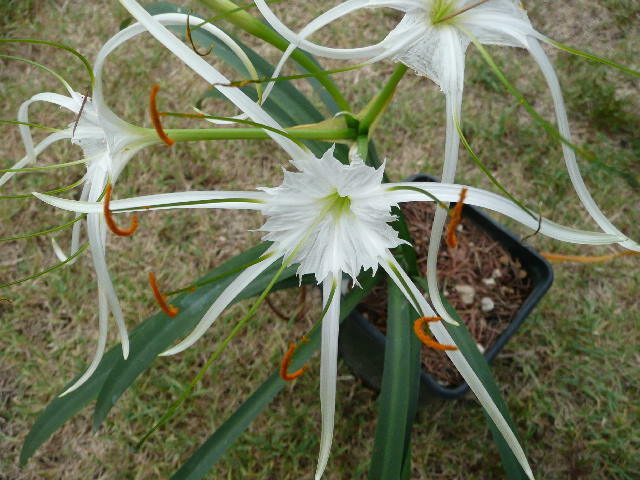 Hymenocallis sp. 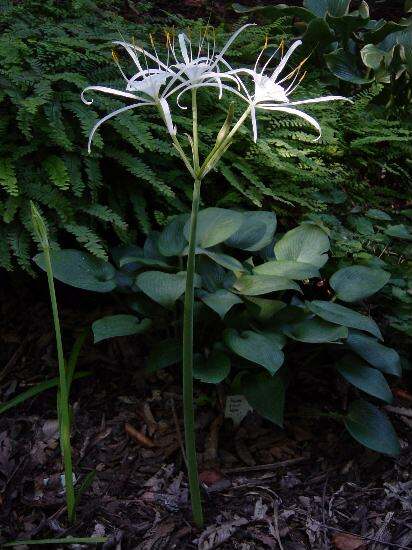 was originally on the mystery bulb page. 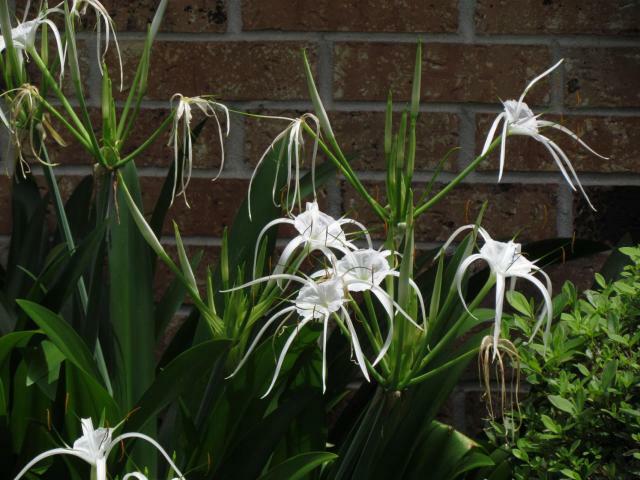 Brad M wrote: "this variegated Hymenocallis has been grown in Australia for many years. 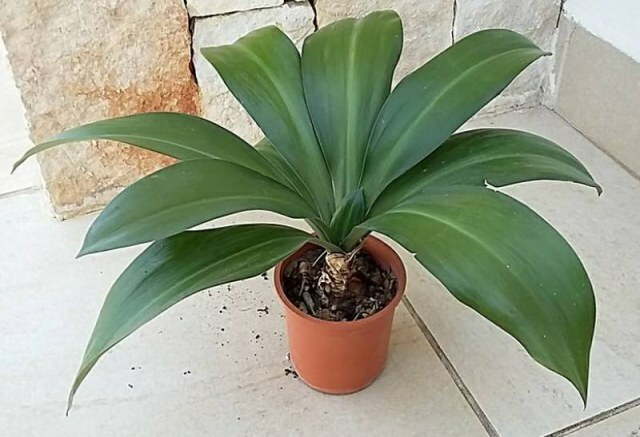 It's rather tropical in its growth, and stunts in cold weather. 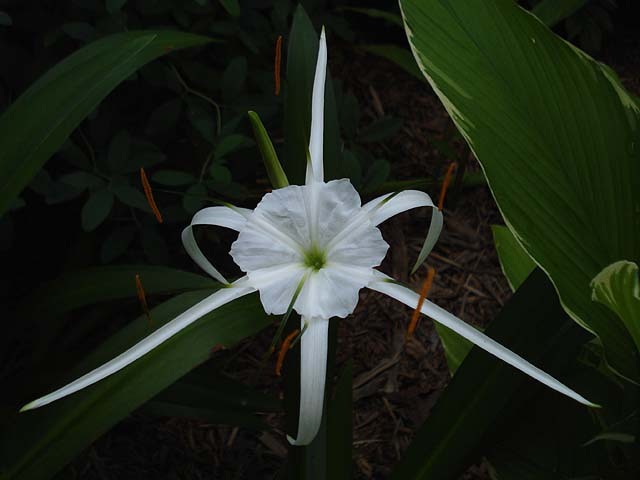 I cannot decide if it's Lilium caribaea or Lilium littoralis. Do you know which one is more likely here?" Discussion centered around the lack of good information about the genus. 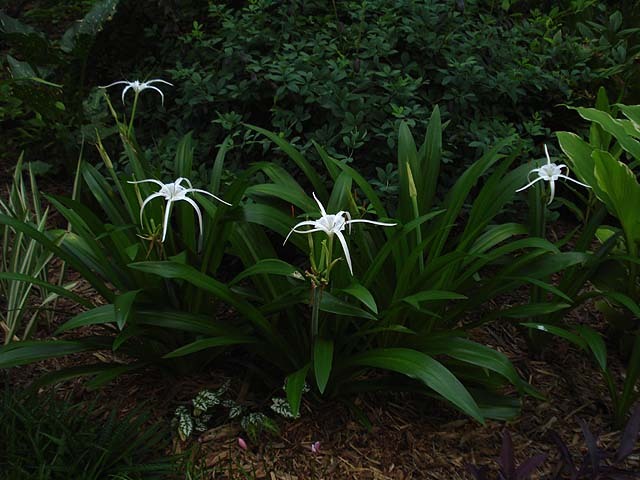 One source from Australia thought it could be Lilium littoralis. 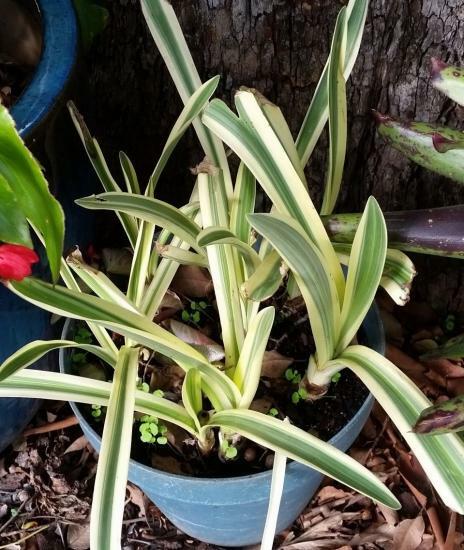 Photos on the internet that may or may not be correctly identified show variegated leaves in both of those species. 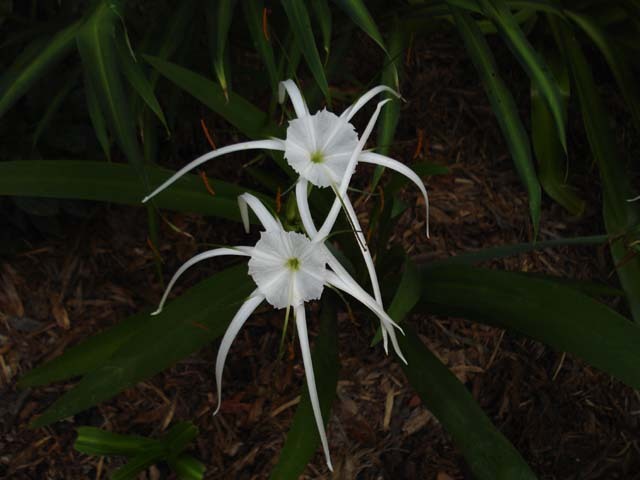 Hymenocallis tridentata Small (syn. 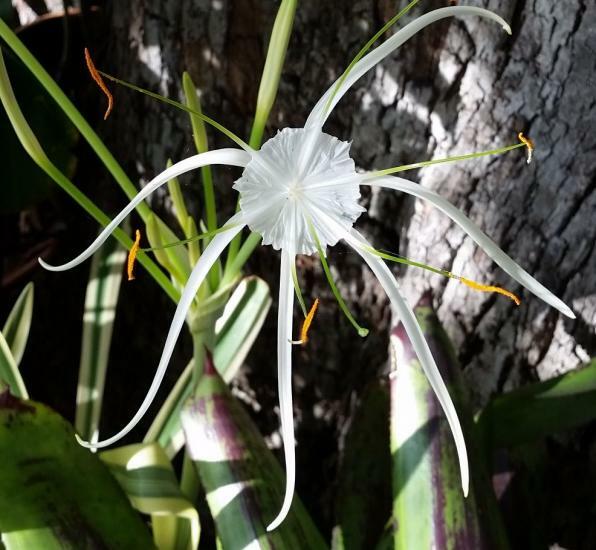 Hymenocallis traubii Moldenke) is a spring-blooming species native to Florida. 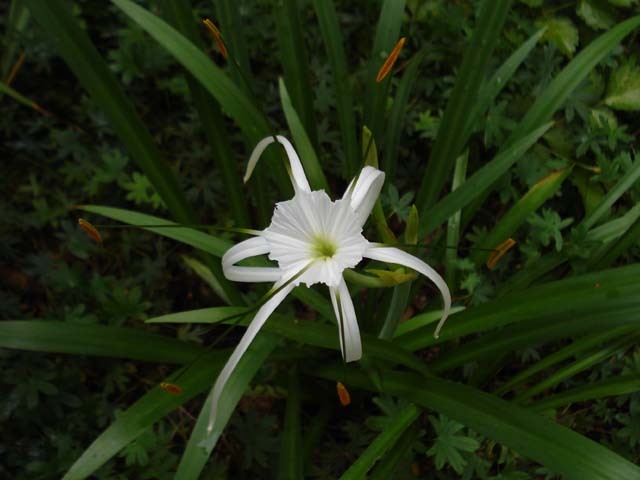 It is a small plant with large flowers. Photo taken May 2006 by Jay Yourch. 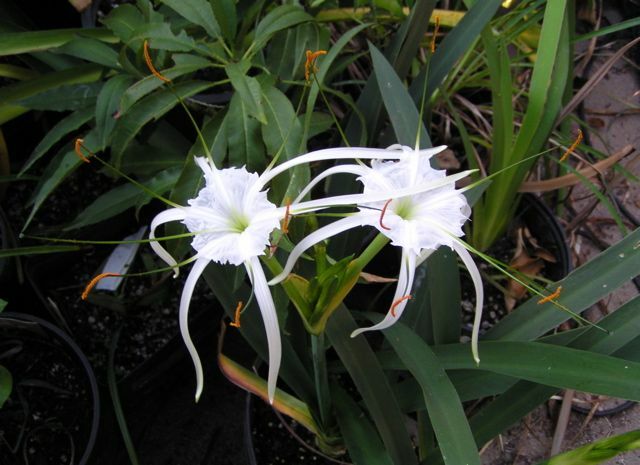 Hymenocallis 'Tropical Giant' has broad, glossy, stiff, dark green foliage and nicely proportioned flowers. Note how three of the six segments display more pronounced recurvature. Photos taken by Jay Yourch. 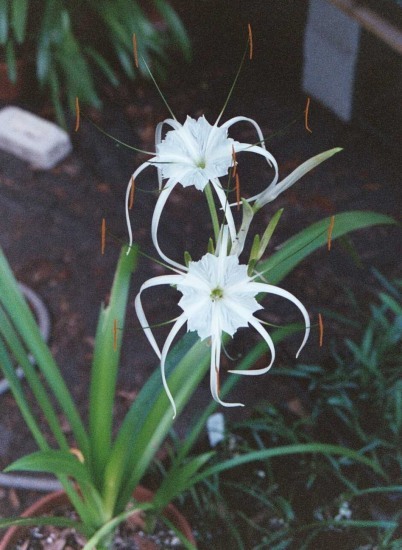 Hymenocallis tubiflora Salisb. is from South America. Photos by Kevin Preuss and Jay Yourch.